As China's increasingly uses its trade and legal powers to put foreign companies at a disadvantage in its internal market, the prudent strategy is to consider alternatives. Apple's largest iPhone assembler, Foxconn, is considering producing the devices in India. As difficulties in the China market grow, India is attracting the world’s tech companies, both for its potential as a manufacturing base and for its huge emerging market of 1.3 billion consumers. Manufacturing high-end iPhones in India could help lower prices by allowing Apple to avoid a tariff that adds 20% to devices imported from China. Expanding business in India could also offer Apple an alternative to China, the world’s largest smartphone market. (But) Indian workers aren’t as skilled as Chinese and India’s infrastructure lags behind China’s. Apple's largest iPhone assembler, Foxconn Technology Group, is considering producing the devices in India, people familiar with the matter said, a move that could reduce Apple’s dependence on China for manufacturing and potentially for sales. Apple currently manufactures most of its iPhones in China through Foxconn, a Taiwan-based company formally known as Hon Hai Precision Industry Co. 2317 1.00% , as well as via other contract manufacturers. That business model, along with a sizable reliance on sales in China, has made Apple vulnerable to rising U.S.-China tensions over trade and geopolitical rivalry. Foxconn said in a statement it doesn’t comment on current or potential customers or any of their products. An Apple spokesman in India declined to comment. As difficulties in the China market grow, India is attracting the world’s tech companies, both for its potential as a manufacturing base and for its huge emerging market of 1.3 billion consumers. Only about a quarter of Indian consumers own smartphones, according to research company eMarketer. Apple has struggled to crack the Indian market, with its already small market share dropping last year to about 1% from about 2% in 2017. Apple has so far built mostly lower-end models in India. Wistron Corp. , another Taiwanese contract manufacturer, began assembling the SE model, then Apple’s cheapest, in the southern state of Karnataka in 2017. Those were the first iPhones made in India, and Wistron has since started assembling the 6S model there as well. Foxconn is currently considering producing higher end, pricier iPhones in India, including models with organic light-emitting diode, or OLED, displays, the people familiar said. The relatively high price of iPhones compared with those of other brands has hampered Apple in the Indian market, analysts say. Manufacturing its high-end iPhones in India could help lower prices by allowing Apple to avoid a tariff that adds 20% to devices imported from China. An expanding business in India could also offer Apple a potentially huge alternative to China, the world’s largest smartphone market. Apple is grappling with weaker-than-expected demand for its iPhones. Lackluster China sales of iPhones in part contributed to Mr. Cook this month announcing Apple’s first cut in revenue guidance since he took the helm in 2011. 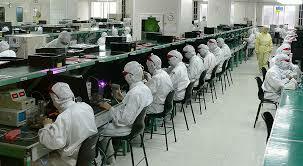 Foxconn has facilities in India and produces devices there for companies such as Chinese smartphone maker Xiaomi Corp. While it has produced iPhones elsewhere, including Brazil, Foxconn currently relies on China to produce the devices on a large scale. Indian media reported late last year that Foxconn would begin production of various models of the iPhone in the country. In looking to expand production beyond China, Foxconn has been studying Vietnam as well as India, the people familiar said. It is leaning toward India because of the market’s growth potential, these people said. On the negative side, the people said, Indian workers aren’t as skilled in precision manufacturing as their Chinese counterparts and India’s infrastructure lags behind China’s. In addition, they said, India will have to do more to develop its smartphone supply chain to compete with China, where Beijing and local governments have worked to move factories up the value chain.